I need a faucet that has a shank length that will go through a 1 1/4 &quot; thick granite. What is the shank length on this faucet? 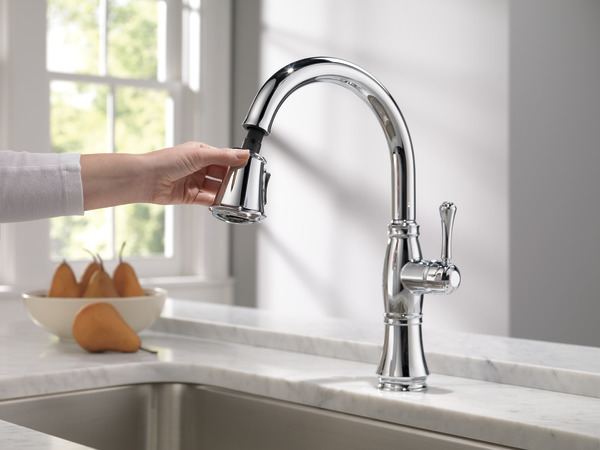 Does the Cassidy single handle pull down faucet swivel 360 degrees? I want to install it left handed. Thank you for your question. Delta Faucet model # 9197-DST does swivel 360 degrees. Does it come in brushed nickel? How do I fix very low water flow -- NOT at the spray nozzle? 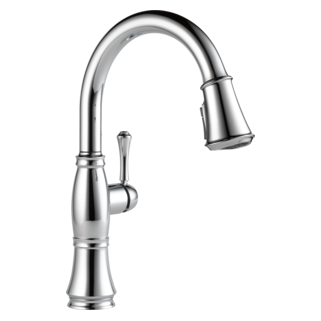 My 9197 AR DST faucet has *very* low flow, possibly due to debris in the line from recent plumbing work. The problem is *past* the supply line shutoff valves but *before* the spray head/nozzle. How can I disassemble the line from the mixing valve to the output line connector and clean it out? I have disassembled the mixing valve and found no problems. It's possible I reassembled the mixing valve incorrectly, but I doubt it, as it appears that it can only be assembled one way. Does this faucet revert automatically to stream mode from spray mode when you shut the water off? Delta Kitchen Faucet 9197-DST was just installed today and one of the sprays doesn't seem to work correctly. One soft spray and the other comes out balloon like. The plumber doesn't think anything is wrong but it looks strange. Is there an adjustment? What material is the pull out hose made of, where can I find a picture to see the style, and what is the diameter of the hose? I'm looking for a metal hose, not plastic. I recently purchased this faucet and the description states there is a &quot;temporary water flow increase&quot; possibility with this faucet. Is this true? Since our psi is less than 60 because we are on a private water supply where the psi is generally not set as high as municipal sources, the water flow for this faucet is quite weak. A temporary water flow increase to fill large pots is important. Will be disappointed/frustrated if this is not possible. 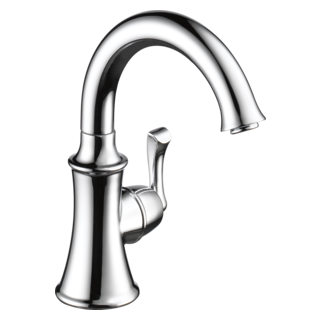 We have had an Delta faucet model 9197 professionally installed - the weight for the spray nozzle does not pull the nozzle back into the faucet when you are done spraying - you have to manually push it back into the faucet. Do all of your faucets have steel braided pull out hoses or are they fiber? How do you tighten the on/off handle? This image is the RP72684 &quot;button&quot; that you have to remove to tighten the set screw. I got mine off with an awl, the head end of a straight pin might work too. If your sink is next to a wall, you can't see this button without a mirror or sticking your head in the sink. After tightening the set screw (with a dab of blue Lock-tite), I can't think of any reason to put this back on. 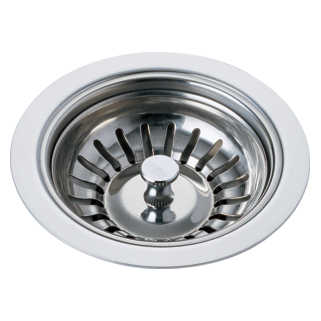 i like the style of this product, but some reviews suggest that its too big for a 24&quot; wide sink. Is there a smaller similar product? Can someone tell me the vertical distance (space) between the valve and the sink / escutcheon? Our dishwasher air gap is mounted just a few inches from the hole for the faucet. It's been heck trying to find a faucet that has a right-side control lever that doesn't interfere. This model appear to have a higher mounted control lever but I can't find the measurement in the specifications. Which finish looks better with a stainless sink - Arctic Stainless or Polished Nickel? I am having a difficult time being able to decide based on the online images which of these finishes will look better with a stainless sink. Any advice? What type of metal is used and where? I have searched all the Q&amp;A answers, and although a couple of people asked what the faucet is made of, the answers given are not specific enough. Exactly what type of metal is used- Brass? Zinc? Zamak? What parts are metal and what parts are plastic? 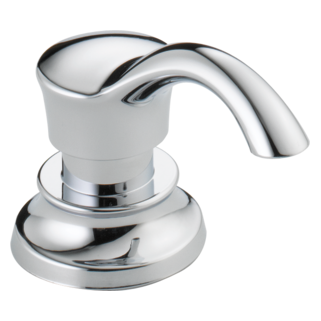 Your website conveniently (actually inconveniently) leaves out all details regarding material which is not a good sign for anyone looking for a quality faucet. 1. 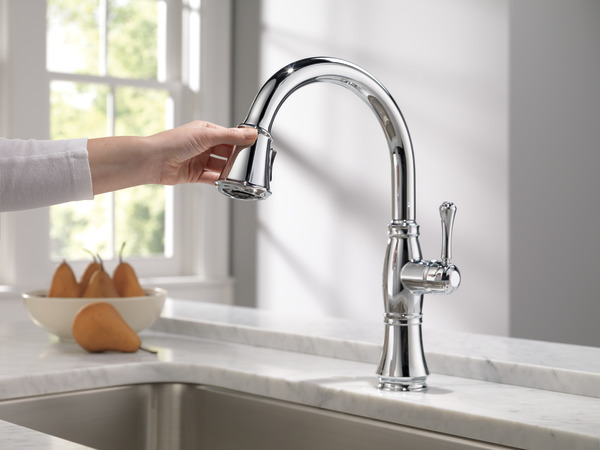 Which way do you move the side-mounted lever handle to turn the water ON - Up or Down; Front or Back? 2. Does the pull down spray wand have a water shut-off button? That is, can you shut the water flow completely OFF from the pull down? To turn the faucet on, you move the handle out. Front and back are the temperature control. Back being hotter, cold is forward. There is not a shut-off on the pulldown spray attachment, just a rocker switch for spray and regular flow. Can we have the handle on the left side? 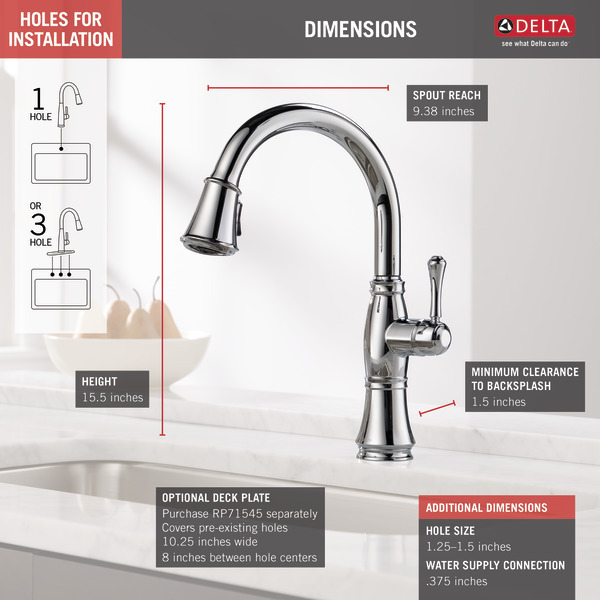 Can a Delta Cassidy 9197-AR-DST sink faucet be installed in a sink with three holes and how are the extra two holes dealt with. &nbsp;Also, does this faucet match with the DeltaRP71543 Soap/Lotion Dispenser that can be used to repurpose the current spray hole? 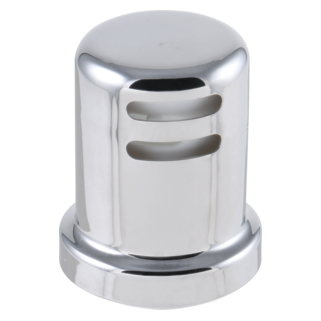 Does this faucet come standard with a deck plate to cover the extra holes in a typical 4 hole sink? I see the soap dispenser is not included. 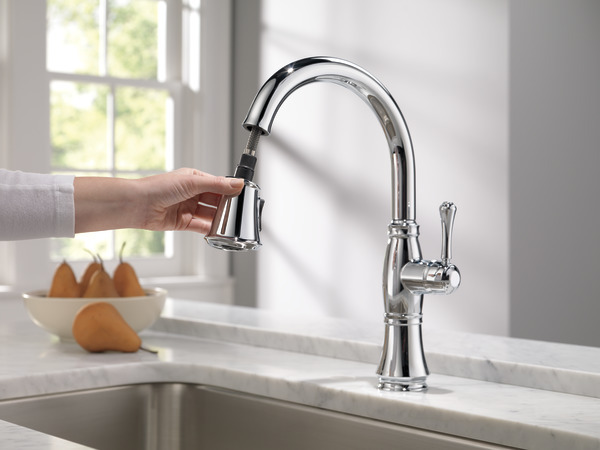 Will soap dispenser model RP1002AR coordinate with the Cassidy Single handle pulldown faucet? Thank you for your question. 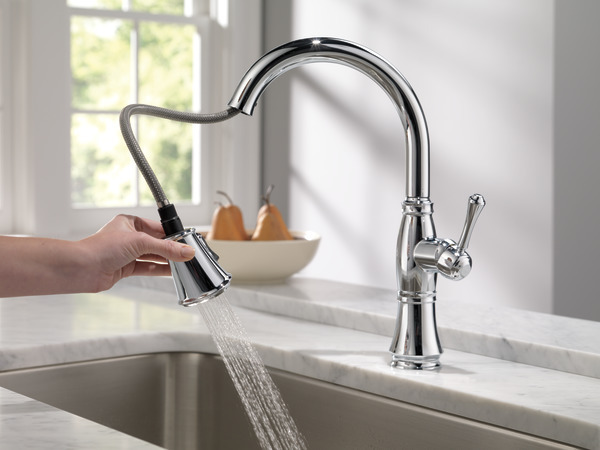 Delta Faucet model # RP1002AR will work with the Cassidy faucet. 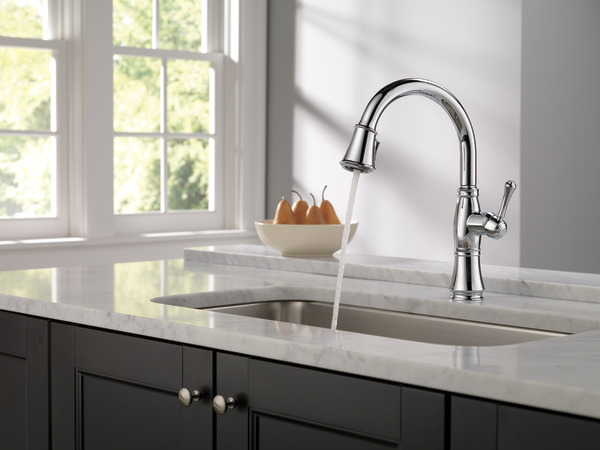 However, we recommend Delta Faucet model # RP71543AR to coordinate with that faucet. It is still up to the customer's preference to pick one. Thank you for your question. The difference between the two valves is how they operate. The &quot;Euromotion&quot; valve operates to the side as well as back and forth. Both valve contain our Diamond Seal technology. what is the horizontal distance from the front of the faucet the the center of the spout? 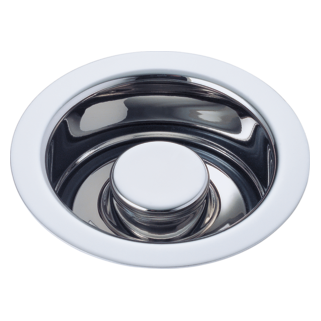 Can the base with handle be rotated forward to about 4 o'clock position over the sink to reduce dripping on the counter? Can the on/off handle on the Cassidy model be put in front, rather than on either side? I prefer to have my hot/cold selection be left and right, instead of front and back. Is there any reason why this could not be done? Thank you for your question. 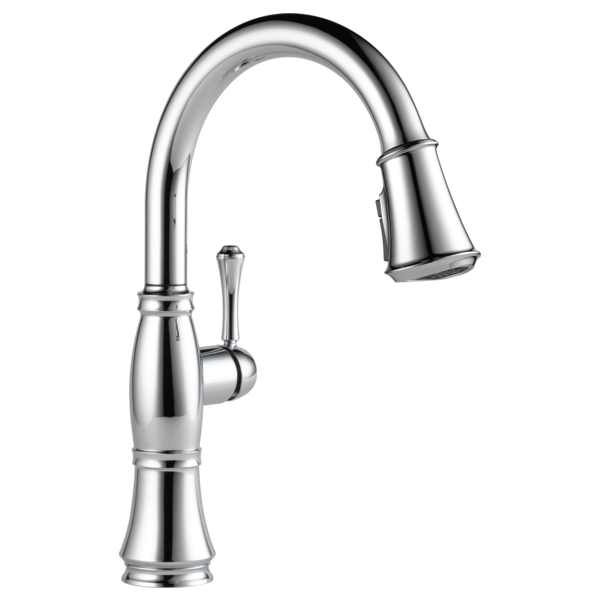 Delta Faucet model # 9197-CZ-DST can be turned so that the handle is in the front ranther than on the side. The whole body of the faucet will need to be turned when it is installed. On the Cassidy 9197-RB how do I remove the filter on spray head to clean? On the Cassidy 9197-RB how do I remove the filter on spray head to clean? I see how to unscrew the spray head itself, but is there a way to clean being the filter on both sides? It appears the aerator side has a metal ring that can be removed--how do you remove that? I have low flow on this faucet but not others. I have checked the connections, etc. Is the Cassidy 9197-ar-dst in arctic finish all metal? Also, does the spray button lock or does one need to hold the button down for spray mode? does this faucet come with the option of being hands free? if so how much and would it be electric?